**Data for Québec were not available at the time of analysis. The rate of hospital admission among children and youth due to asthma is lower in Canada than the US. 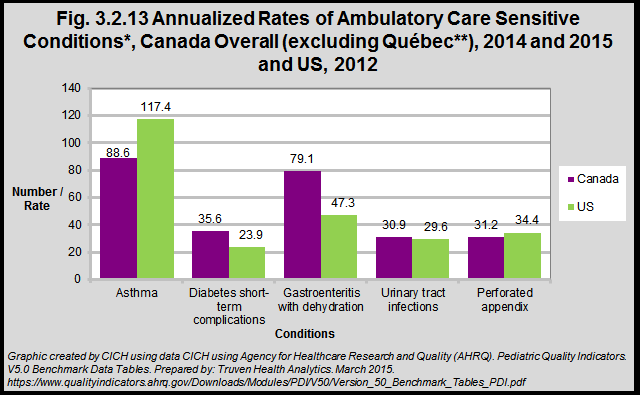 The rates of hospital admission among children and youth due to diabetes with short-term complications and gastroenteritis with dehydration are higher in Canada than they are in the US. The rates of hospital admission among children and youth for urinary tract infections and perforated appendix (as a percent of all appendicitis admissions) are similar in the two countries. Differences across Canada and the US in the observed rates of admission for the two chronic conditions may be explained in part by differences in the prevalence of disease of the populations. Canada has higher rates of type 1 diabetes in children (than does the US1,2) and these indicators are measured for the population at large. It is also worth noting that routine diabetes care for children is done by specialists and multi-disciplinary diabetes teams rather than in primary care and so these differences may not reflect solely the quality of primary care. A recent study comparing these same outcomes in low income children with diabetes in Ontario compared with California showed lower rates in Ontario3. Asthma prevalence as measured by population-based surveys are similar in Canadian and American children and youth and so would not explain the higher rates in the US4,5. For the acute ambulatory care sensitive conditions, rates of urinary tract infection and the proportion of children with appendicitis presenting with perforation are very similar across the two countries. Given those similarities, it is likely that the higher rate of admissions for gastroenteritis and dehydration seen in Canada is not related to overall access to primary care but may be due to differences in coding practices of hospital diagnosis data6 and the use of rotavirus vaccine. Rotavirus is the most common cause of gastroenteritis in infants and children. The first of two rotavirus vaccines were licensed in both countries in 2006 but public funding for the vaccine was initiated in the first 5 Canadian jurisdictions (BC, SK, ON, PEI and the Yukon) between 2010-2012 and (AB, MB, NWT, NLD) between 2013 and 20157. As of September 2016, NB, NS and NT still do not have rotavirus vaccination programs8. Uptake of the vaccine since its licensing in the US has been relatively high (>80%)9,10. 2Diabetes in Canada: highlights from the National Diabetes Surveillance System, 2004-2005. Public Health Agency of Canada. 2008. [accessed 2015 May 15] http://www.phac-aspc.gc.ca/publicat/2008/dicndss-dacsnsd-04-05/index-eng.php. 3CMAJ Open. 2016 Dec 1;4(4):E729-E736. doi: 10.9778/cmajo.20160075. Health care for children with diabetes mellitus from low-income families in Ontario and California: a population-based cohort study. Kaiser SV, Sundaram V, Cohen E, Shulman R1, Guan J, Sanders L, Guttmann A. 6Importance of ICD-10 coding directive change for acute gastroenteritis (unspecified) for rotavirus vaccine impact studies: illustration from a population-based cohort study from Ontario, Canada. Wilson SE, Deeks SL, Rosella LC. BMC Res Notes. 2015 Sep 15;8:439. doi: 10.1186/s13104-015-1412-5. 7Assessing the risk of intussusception and rotavirus vaccine safety in Canada. 9Vaccine. 2016 Dec 7;34(50):6396-6401. doi: 10.1016/j.vaccine.2016.10.005. Epub 2016 Nov 1. 10Uptake of rotavirus vaccine among US infants at Immunization Information System Sentinel Sites. Pringle K, Cardemil CV, Pabst LJ, Parashar UD, Cortese MM.